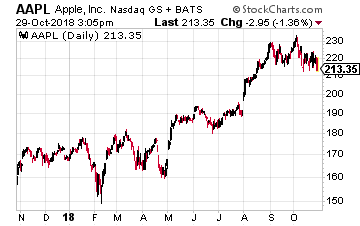 Can Apple Save Your Portfolio from the Market Crash? After disappointing results and forward guidance from both Alphabet and Amazon, Wall Street is now focused on the biggest technology stock of them all – Apple (Nasdaq: AAPL) – and its results, which are being announced on Wednesday, November 1 after the close. It is hoped by the pundits you see on CNBC that Apple’s results will blow away expectations and ‘save’ the market. I though am much more interested in what the long-term future holds for Apple, rather than the very short-term. And here the outlook is rather murky… Apple has both great challenges and great opportunities. Let me start off first with a major challenge for Apple… China. Apple shareholders are well aware that China is Apple’s second-biggest market after the U.S. And it has been a major source of growth for Apple in recent years. China itself is responsible for 13% of overall revenues, with the Greater China region accounting for 20% of Apple’s revenues. But that looks to be changing. That change may be the result of the trade war or, more likely, due to changing consumer tastes in China.